My feet, enjoying a well-deserved rest on my desk. The town’s parking meter maid resumed her rounds this morning after a winter hiatus. The birds are chirping, the snow is melting and the thermometer is supposed to hit 50 today. But that isn’t how I know that spring will come. 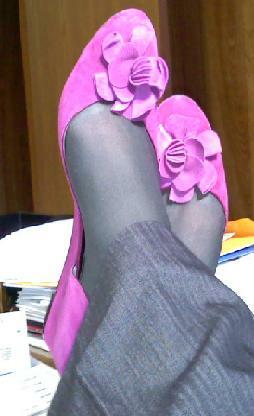 I wore violet suede shoes with little flowers on them today. I am not a particularly “girlie” girl. I’m a practical, matronly woman. My winter boots, my constant companions until just a few days ago, are sensible. They are crepe-soled, flat-heeled, ankle-high and they zip on both sides for easy on-and-off. OK, they’re Totes. Dear Sweet Lord, they are Totes! I am not THAT old. 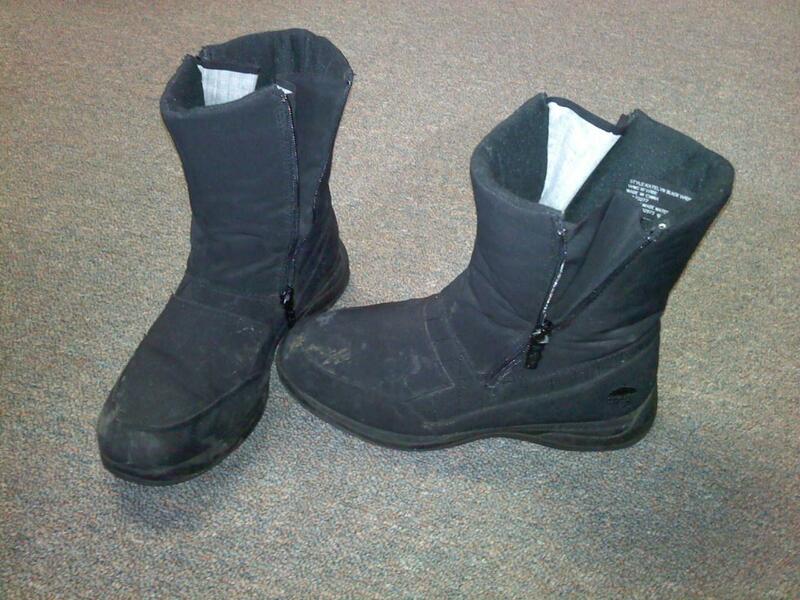 I was just seduced by the easy, winter practicality of them. You served me well, noble steeds. I was half asleep this morning, rooting around in my closet when I came up with the violet shoes. I forgot I had them. They were an impulse buy – not my usual sensible pumps. Next thing I knew, my feet and I were striding confidently out the door, clad in violet suede with flower adornment. It was pure instinct. Like the swallows returning to Capistrano and the salmon swimming upstream to spawn. I answered an ancient call, hard-wired in my DNA. In spring, a (young) woman’s fancy turns to thoughts of pretty shoes. This entry was posted in General Ramblings and tagged fashion, humor, life, postaweek2011, shoes, spring. Bookmark the permalink. Now I’m curious…what else is hiding in your closet? Did they ever find Jimmy Hoffa? I think this is where you invoke your 5th amendment right to remain silent, but do yourself a favor and clean out that closet. Spring will come. I wore a melon colored dress today. This color is not commonly worn in the winter but I’m feeling springy! Any of the sherbet colors are harbingers of spring. If we wear them, it will come! Peg, you are SO not matronly!!! Those are great shoes. I have rain boots, but they are bright yellow and they have heels, so I like wearing them. Visualizing you jumping into all the puddles in your shiny, yellow boots – can’t get more fun and springlike than that!